I’ll be completely honest with you guys, when I was asked to enter the SACO Kitchen Challenge I was way too excited for it and immediately thought it was the right time for uploading something on my YouTube Channel; however the video I was thinking about isn’t similar to this one by any means. It turned out fine, but I wanted something more special and personal and I have refused to write this post down until now just because I wasn’t completely happy with the video. I guess YouTube it’s totally not my thing, I’m too severe with myself and my skills for something so tricky! However back to the challenge! I was asked to imagine to be in one of the SACO kitchens and prepare a meal for two, two different course under £20, in less than 2 hours, whatever I wanted to cook! You know I love food and baking and this was just my kind of thing. I prepared one of my all time favourite main course, au gratin potatoes to be precise, which is also something my boyfriend quite love too since I introduced him to it, and since it take a little while to bake in the oven, I decided to pair it with one of my favourite quick and easy 10 minutes total desserts, that you might remember as my Lava Cakes For Two. 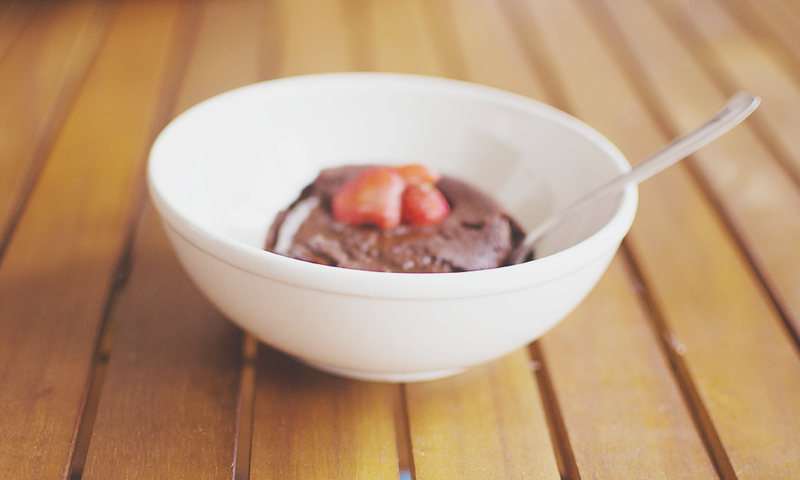 You’ll find the full recipes right below, they took me less than 2 hours and definitely less than £20, and hopefully this post will inspire some romantic dinners! 2. 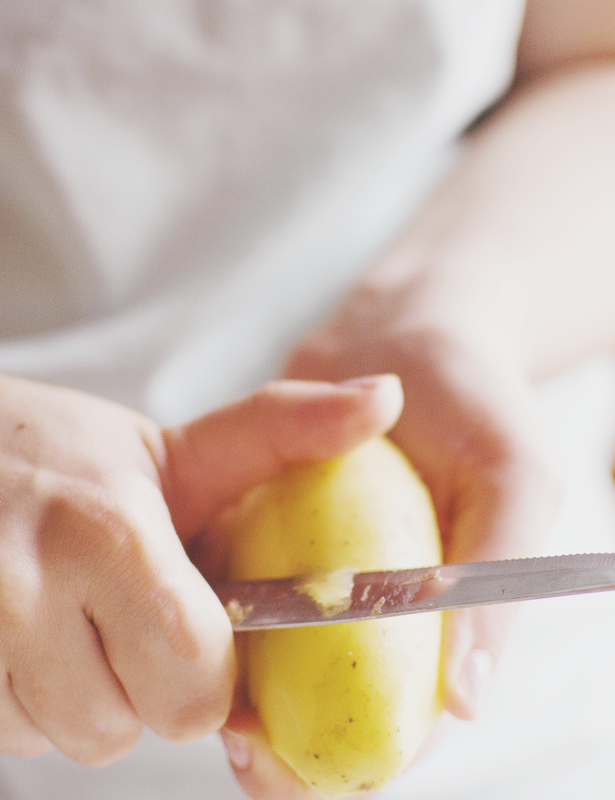 Peel the potatoes with a vegetable peeler or a classic knife and cut them into thin slices trying to make them have all the same thickness to avoid that some will be more cooked than others. 3. 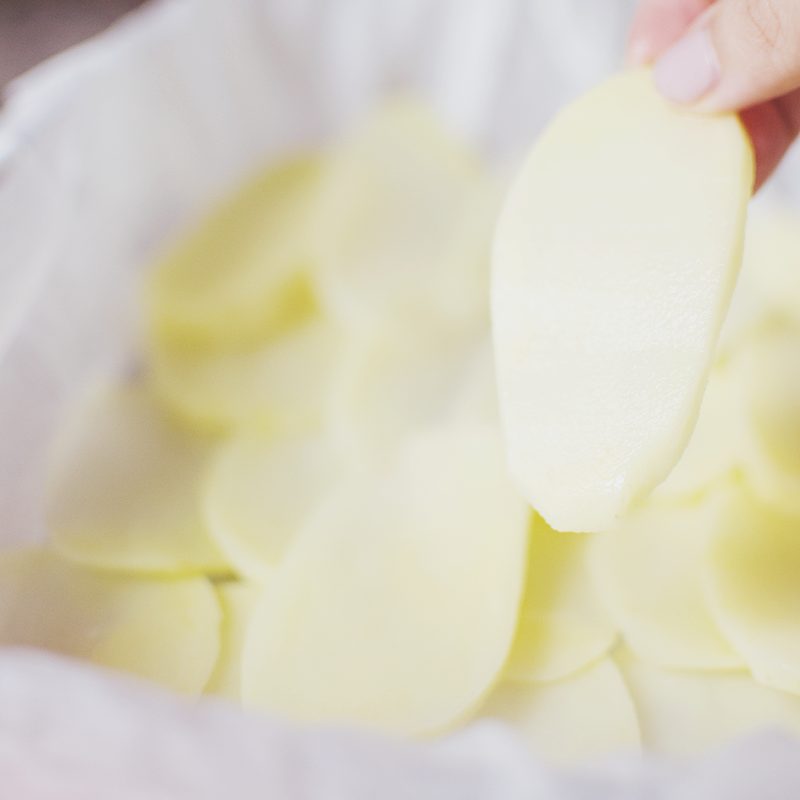 Take a small glass oven dish, line it with some wet parchment paper and start placing a first layer of potatoes to cover all the surface. Add pepper and salt to taste above the first layer and then create a second layer in the same way. Again add pepper and salt. 4. In a saucepan melt the butter on a low heat, then add the milk all at once and start stirring along the way. 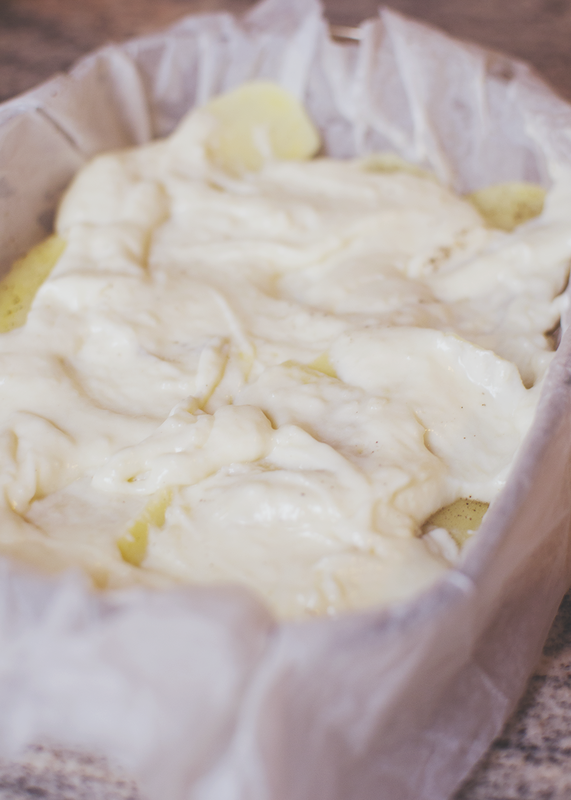 Throw in the flour which will help at making our cheese cream thicker, and continue to stir until it starts feeling thick enough. 5. 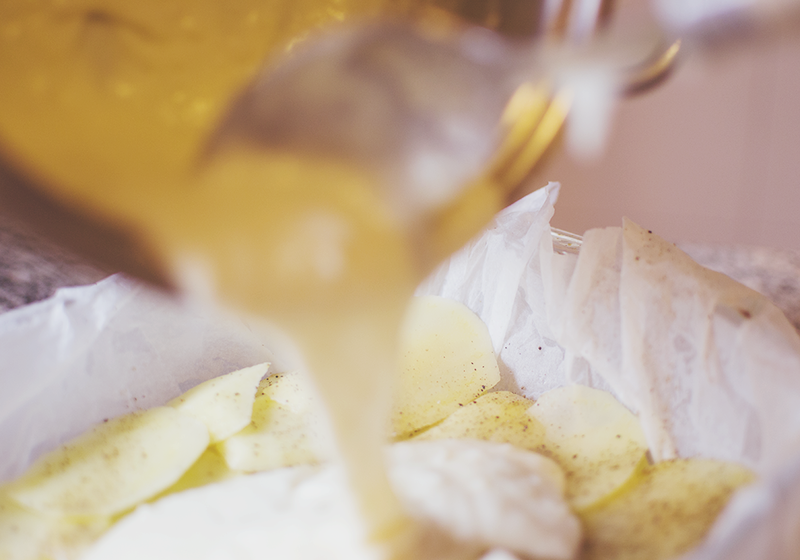 Remove the saucepan from the heat and add all the grated parmesan when the cream it’s still warm – this will help melting the parmesan and creating a smooth cream. Taste the cream and add salt if needed. 6. 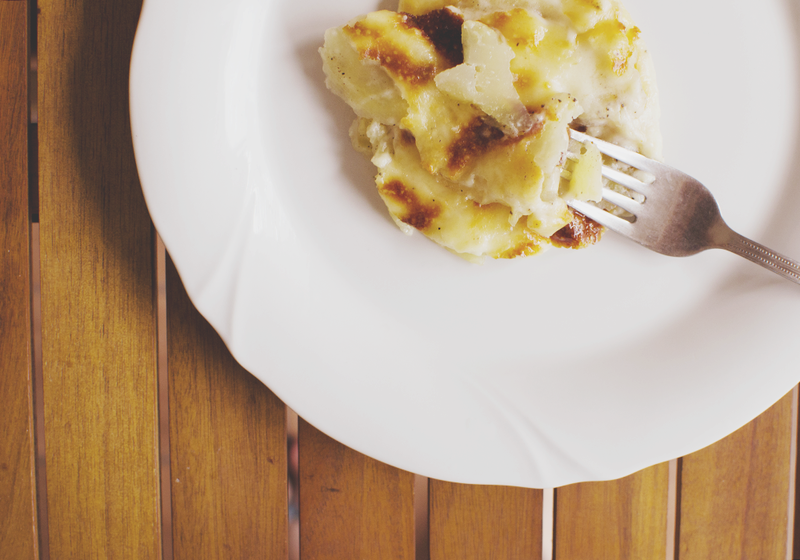 Pour the cheese cream over the potatoes and level it with a spoon in order to create a smooth surface. 7. 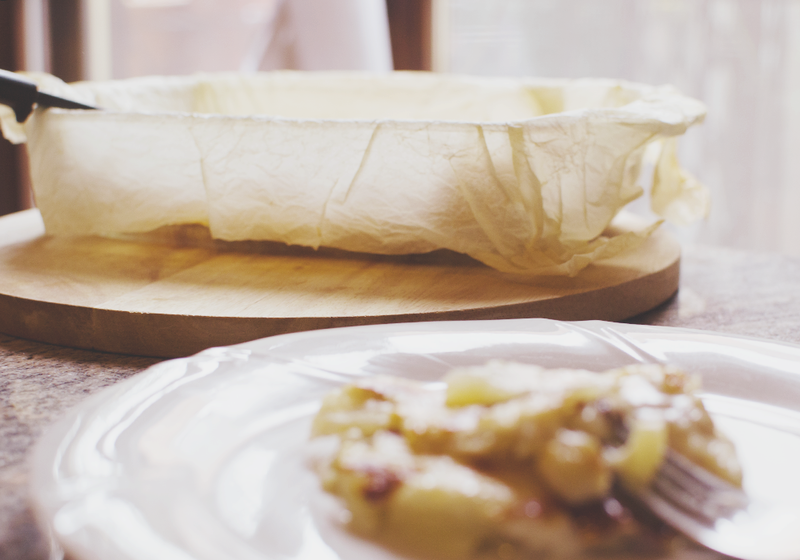 Place an aluminum foil to cover the oven dish and cut the latter in the middle so that the steam will have a way out. Then place the oven dish in the oven for 1 hour (210/220°C). 8. 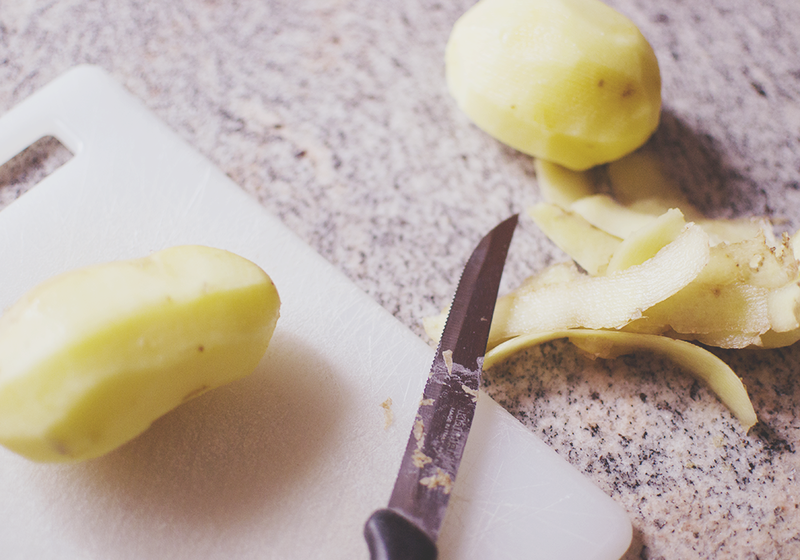 After one hour remove the aluminum foil and check if the potatoes are soft using a knife or a fork. If the potatoes don’t look cooked, just leave them in the oven with the aluminum foil for a little longer before going on. If yes, just leave them there for 15/20 minutes more until the cream on top starts becoming crunchier and golden brown in some spots. 9. 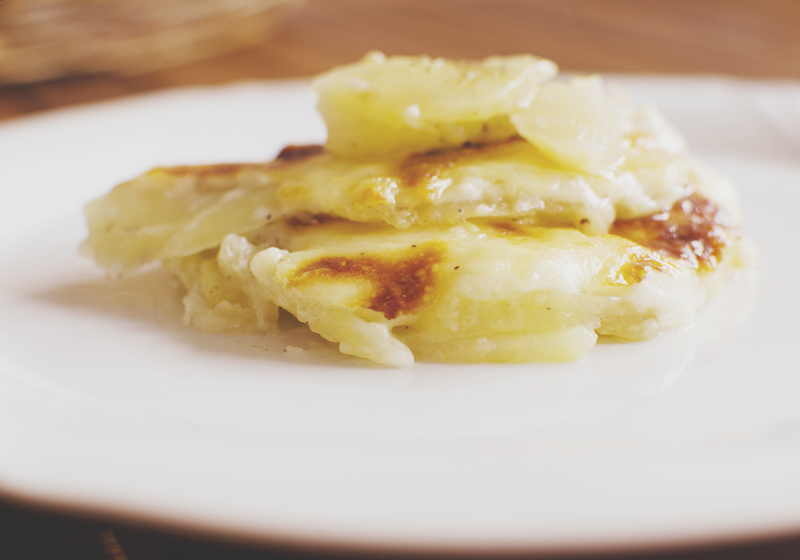 Lastly remove the potatoes from the oven and serve two generous portions on your dinner plates! 1. 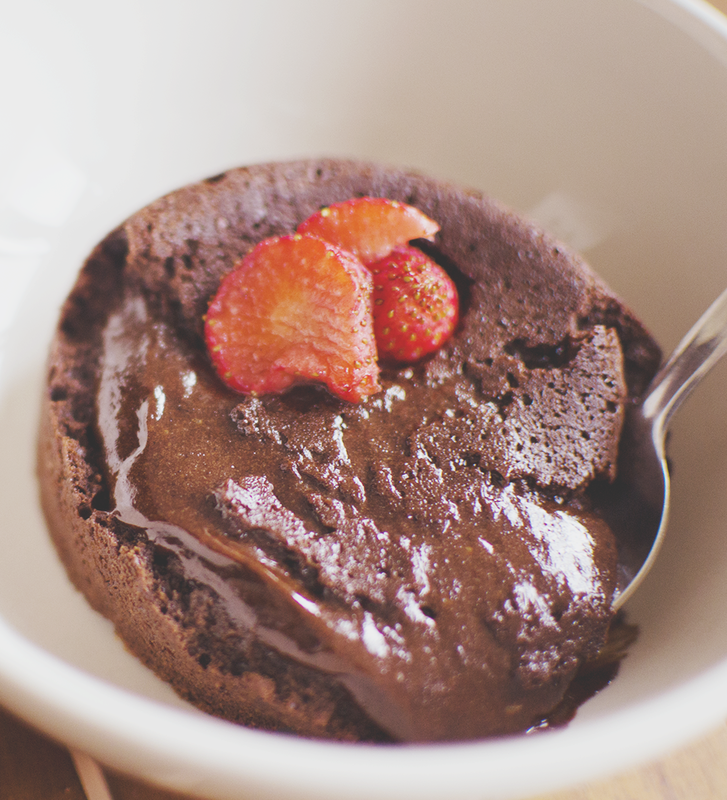 Preheat the oven to 200°C (if you followed the previous recipe your oven should already be at the right temperature and you’ll probably start with the lava cakes recipe while your potatoes are still in there). 2. 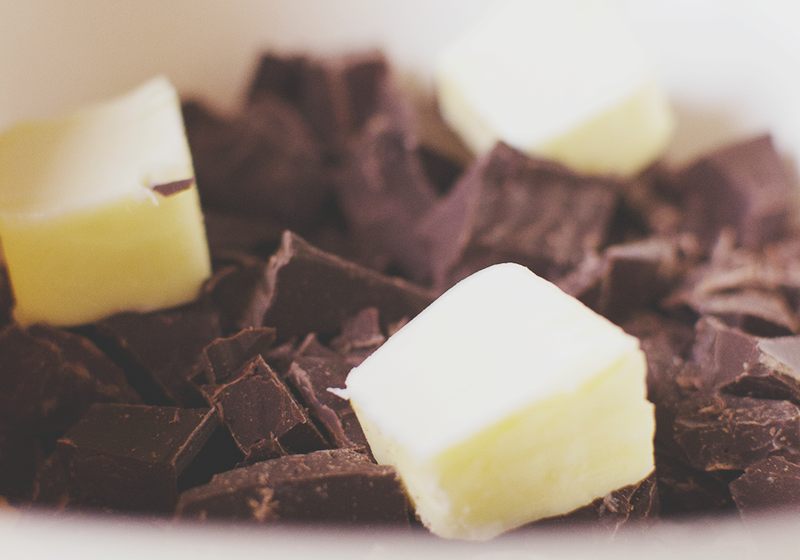 Cut the chocolate into little cubes so that it will melt more quickly. 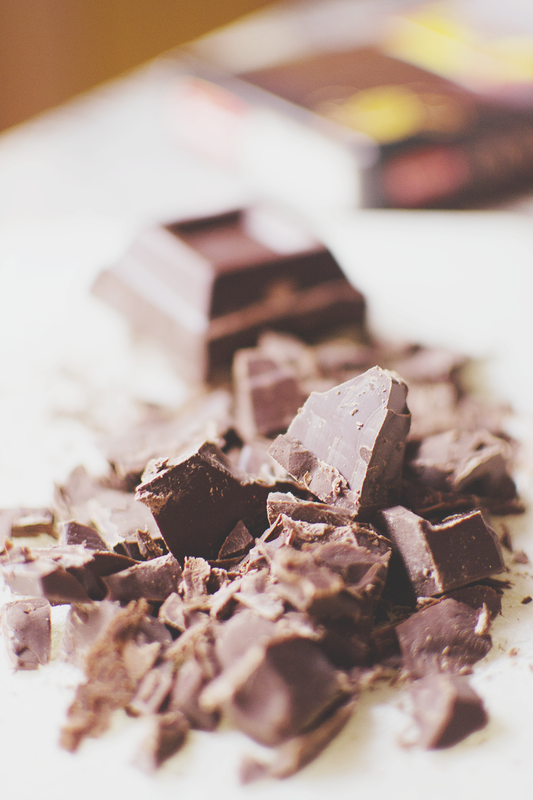 Pour it into a large mixing bowl with the butter and melt them in the microwaves checking them a few times and mixing them along the way until you’ll have a smooth creamy mixture. 3. 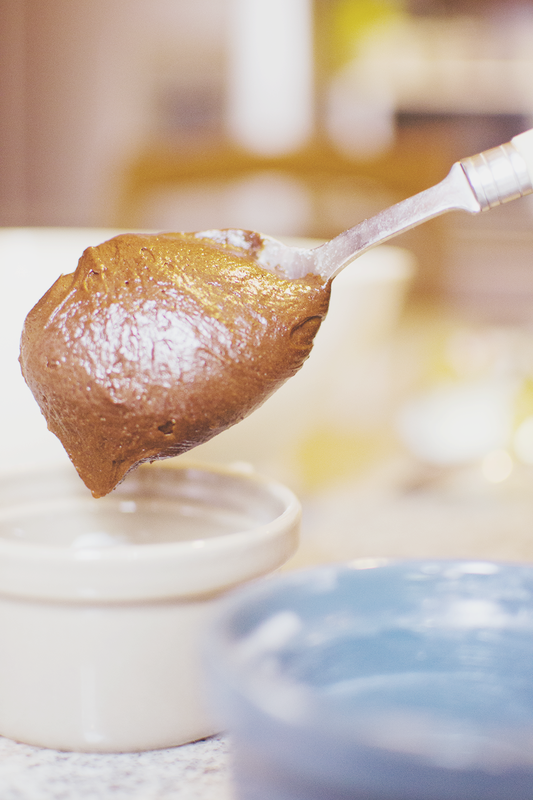 Leave the chocolate mixture to cool a little bit then add the egg and egg yolk, the flour, the sugar and the salt and mix well with a spoon. 4. 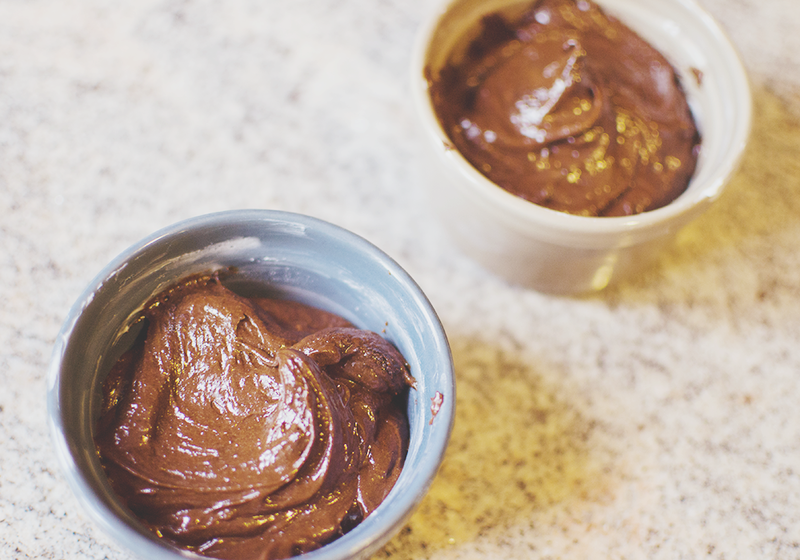 Pour an equal quantity of the obtained mixture into two ramekins (find mines here) or in two mugs or dessert bowls using a spoon. 5. Place the ramekins/mugs/bowls in the oven for no longer than 10/12 minutes and then leave them to cool just until the bowls are cool enough to handle. 6. Flip them over two dessert bowls or pie dishes; decorate with a strawberry on top and enjoy the melted heart when still warm! What about your favourite recipes for a dinner for two?